"In addition to working in the family vineyard and businesses, Cindy has a passion for speaking and teaching God's word about the vineyard." 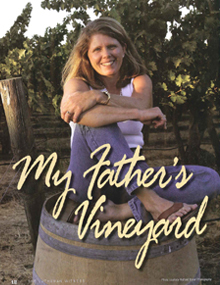 This article was written by a prominent wine writer who spent time with Cindy in the vineyard. 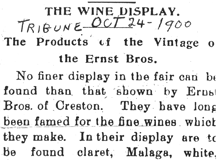 The Ernst Family received media from 1900 and 1901 touting their wine growing and wine making expertise. These articles give an amazing prediction for what is happening 100 + years later in the wine industry from the eyes of this wine writer. This writer also has a national perspective as to the controversies in the industry. The blurry photo doesn't show the B-26 engine that torpedoed its way 13 feet into the ground in the field 200 yards south and east of Cindy's home. 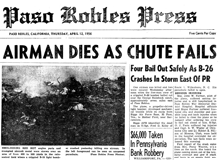 Four of the five airmen survived the crash and were triaged in the family home until medical help arrived. This event is commemorated by The Crash blend. This article, written by current Paso Robles City Councilman Fred Strong in conjunction with the Paso Robles Wine Festival, summarizes how Howie grows great grapes. In 1993 the family vineyards had grown to just over 100 acres, today they comprise 500 acres. 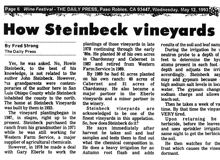 The article states that our initial vineyards were planted in 1987 - not correct. Our first vineyards were planted in 1982. 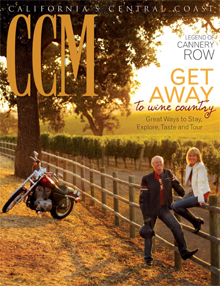 Cindy was chosen as a feature winegrower for a campaign by the Capital Press designed to bring agricultural personalities to the forefront of the consumer's minds. This article highlights Cindy's passions as well as summarizing her various business adventures. You might just get a story out of Cindy if you ask the question this writer asks about WineYard Willy. Steinbeck Vineyards & Winery piloted a project called Vineyards Growing Veggies in 2008. We donated the land, water and expertise. We gathered volunteers and donations from local businesses to build this large vegetable garden. 7,000 pounds of fresh veggies were donated to the local charities who distribute food to the hungry in San Luis Obispo County. 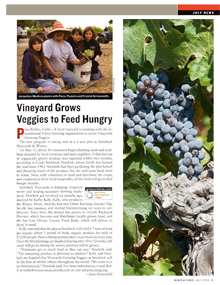 The Vineyards Growing Veggies project received another great publicity piece. Steinbeck Vineyards & Winery's generosity with the land and passion for feeding the hungry touched the hearts of many. The project will continue with the help of many local businesses and volunteers. Other wineries want to plant produce as well, meaning we have the potential to meet the fresh food needs of the hungry in our county in 2009!